Cryptocurrency traders are always looking for products that will ensure their virtual money are kept in a safe, secured place. Whether we’re talking digital wallets or physical ones, like the hardware wallets everybody knows about, these devices have their benefits, as well as their flaws. If you’re looking for a device that’s almost indestructible by fire, water and other natural occurrences, you should give SteelDisk a try. This is a complete review of the device, which means you’ll be able to decide on buying it or not at the end of it. SteelDisk is the newest cold storage unit on the market that’s capable of keeping your bitcoin secrets in the safest environment possible. The storage unit is provided by BitProton, a company that provides a set of tools specifically designed for bitcoins, helping you in storing and also spending your digital assets securely. The company is based in Sakarya, Turkey. SteelDisk has a capacity of 170-byte of cold storage, which helps you to store your extremely sensitive data on an invulnerable material device. As we said, SteelDisk is a stainless steel device, a cold storage unit that will help you to store your most sensitive data when it comes to bitcoins, such as private keys. The device can withstand any environmental conditions that might otherwise damage your devices, such as water, fire, electricity and so on, as well as cyber attacks. You can store any data that you want on it, like private keys, seed words, passwords for any bitcoin or other cryptocurrencies on the SteelDisk. You can now order the SteelDisk regardless of where you live in the world. The people at BitProton have a collaboration with UPS, the global shipping service, which enables them to ship your device to your door in 5 days or less, anywhere on the planet. The device costs roughly $70, which is the base price of the device itself. To that, you’ll have to add a charset, the most common being the base 58 one, which includes 58 characters, three tiles for each of the following characters: 123456789, ABCDEFGHJKLMNPQRSTUVWXYZ and abcdefghijkmnopqrstuvwxyz. The price of the charset is around $4,41. This charset is perfect for things like bitcoin private keys and also for any other cryptocurrencies keys you might have. There’s also the SteelDisk Hexadecimal charset, which includes 10 tiles per each of the following characters: 0123456789 and ABCDEFx. 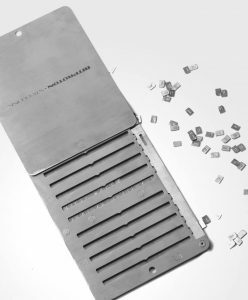 This charset is also priced at $4,41 per batch and it’s ideal for storing cryptographic keys. Another charset that the SteelDisk comes with is the English Latin Charset. This charset contains 2 tiles per each of the following characters: 0123456789, ABCDEFGHIJKLMNOPQRSTUVWXYZ, abcdefghijklmnopqrstuvwxyz and &. respectively. The price quote for this charset is the same as the last two. Finally, there’s a binary charset with 0, 1 and blank tiles, 85 pieces per charset, which is ideal for storing your data in the binary digits. One of the most basic needs any investor that works in the crypto-world has today is the ability to store sensitive data in a safe environment. Today, we’re constantly using this data, such as bitcoin private keys and passwords, in order to trade and make investments on our own terms. These data is extremely sensitive, which is why it’s always subject to loss or leakage. This risk is important and should not be mingled with. Storing your data on paper or electronic devices, like laptop computers, for example, is making it vulnerable. Your laptop could catch on fire, or be dropped into water, which will make it unusable in minutes. Also, it can be subject to a cyber attack. This is why sensitive data must be dealt with by using the very best option there is. SteelDisk comes in and provides a universal solution to an everyday problem every single trader has. The beauty of the product is, you can basically store any sort of data you want, just by entering the private keys or passwords in the cold storage unit and have them locked and secured. That’s it. After you manually insert the keys on the device, you lock it up and have it stored in a safe place that you know off and nobody else. The four types of charsets available, base58, hexadecimal, English-latin and binary, are perfect for any type of data you might want to store on the device. 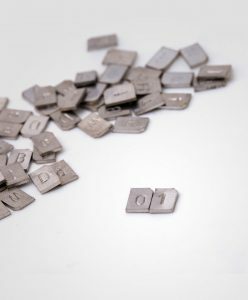 SteelDisk can store up to 170 characters at the time, which is ideal for up to 3 private keys, for example. First of all, you should buy the device and one of the adjacent charsets, the one you feel you’ll need the most, just because of the fact the device is mostly indestructible. It’s made out of stainless steel in its entirety. The plates, the chars and the fasteners, they’re all made to withstand fires, water and other possible damaging situations. Another reason why you should buy the device is that you can pay for it with bitcoins and nothing else. This way, you’re keeping your investment private and you can enjoy the device knowing you’ve paid for it with the most used cryptocurrency there is. If you need another motive for buying the SteelDisk cold storage unit, think of all of those times when your laptop has gone bad. Or when you dropped your phone and, in one second, lost all of its contents. If that would’ve happened with a device that was holding your private keys, it would have been game over for them. With the SteelDisk, the chances of your private keys or passwords to get lost are merely zero, because of the way the device was made. The entire solution for storing your sensitive data comes into one small, designer style device that will last you for a lifetime.